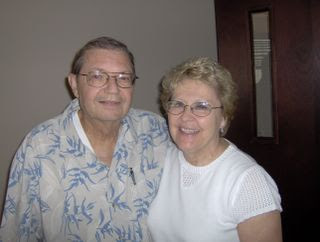 We have received word from Tim and Sue Poyner about the death of his mother, Betty (pictured here with her husband, Randy), on Monday, December 10, following a recurrence of cancer. Betty and her husband, Randy, a longtime pastor and professional counselor in the Fellowship of Grace Brethren Churches, lived in Florida. Yesterday evening, sometime after 9:00 p.m., my mom left her cancer-ridden body and walked into the presence of the Trinity. She was at home surrounded by my dad, my sister Susan and the pastor of the church there in Palm Coast with his wife. Mom had deteriorated physically to the point where she was no longer able to communicate much and had stopped being able to eat and even drink anything. My sister said that her pain had increased tremendously over the past couple of days. Right before she passed away, those surrounding her were sharing memories of her and communicating how much they loved her. She went quietly and peacefully—what we had prayed for her. We’re not sure yet when the memorial service will be. We’ll be in touch with that information.I feel such a mixture of sadness and gladness. I feel aware of the loss of my mom. I especially feel that for my dad. But I feel such a lifting of a weight I’ve carried as I’ve watched her suffer. What a wonderful thing that she is free! Thank you for the various ways you all have cared for our family during this time. We have been deeply touched by your words, your prayers, and the many ways friends in Florida have stepped in and helped carry Mom and Dad in small and big ways. Thank you just doesn’t come close to communicating what our hearts feel. May God’s comfort reach to all. Last night shortly after 9:00 Betty Poyner entered into the presence of God and His heavenly host. Betty told me last week that she was not afraid of dying it was just the process that concerned her. I can tell you that I saw the Lord prove Himself faithful, strong, loving and comforting. With Betty’s family at her constant side, she was kept comfortable and was always being immersed in love. Denise, Seth and I were at the house last night until almost 8:45. Before we left we all held hands and prayed one last time – God answered our prayers and heard our cries. Betty, welcome to your new home – we’ll be there soon! Betty’s memorial service will probably be next Saturday, Dec 22, at 10:30 am.